We live in a divisive time. The world cannot seem to agree on anything. There is little or no tolerance for differing opinions. The choice always seems to be “my way or the highway.” No discourse seems to ever lead to peace. So the big question is why? This is not the first time in history that people have disagreed. Can you imagine the struggles of Moses getting the people of Israel to trust him and follow God’s commands? We find Moses telling them in Deuteronomy that they have no sense, no discernment and if they were as smart as they seem to claim, their own doom would be obvious. Wow, that is right to the point. Moses got the correct point alright but he had gained his wisdom directly from God. In fact, God appeared to him, spoke to him directly and even wrote down some rules on a couple of tablets of stone. Moses was humble enough to accept God at face value and discern God’s Truth. There is danger in divisiveness, a physical danger, even an eternal danger. But how do we know we are defending the correct side of an argument? How do we know that we got it right? God holds us to a high standard of correct behavior and beliefs. Yet if we get it wrong, just like the people of Israel got it wrong time after time, there are consequences. History is filled with them. The good news is that we have a merciful God. This is where our Savior comes in, when Jesus showed up, He not only gave is commands to follow but He even showed us how to know what is TRUE and follow what is TRUE! The task is to gain wisdom, to establish a lifestyle that is in constant pursuit of wisdom so that life can benefit with choices made through Godly discernment. Do you pray, weekly, daily, hourly, and every time you need to make a decision that could impact your life? Is the Bible, God’s Word, part of your educational plan? Have you joined a Bible Study so that you can practice discussing God? If you have children, are they involved in a formal program to develop their faith? Are you observant to the issues of our world, our country and your family that are caused by poor judgment? Do you learn from your mistakes and the mistakes of others? Can you walk away from some disagreements and just agree to disagree? Luke points out that it is Jesus’s mother Mary in chapter 2 verse 52 gives us a hint. Mary shares this about her son: “And Jesus grew in wisdom and stature, and in favor with God and man.” What makes this so amazing is that this verse encapsulates all we know about Jesus’s life from the age of 12 to 30 years old. One sentence, eighteen years’ worth of life’s history. So how did Jesus grow in wisdom? Wisdom is comprised of experience, knowledge and good judgment. With wisdom, Jesus grew to have an acceptable relationship with both God and mankind. This should be all of our own goals too. Jesus’s experience started with a family who cared, His work in a real world as a carpenter, His humility shaped his character. Knowledge on God and life was gained through observation and formal education. 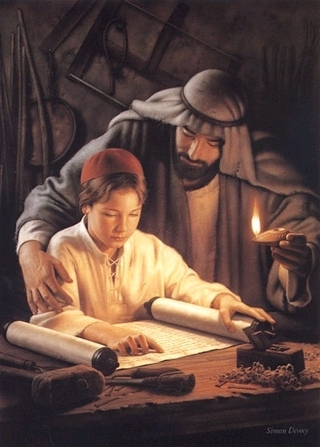 Jesus spent countless hours learning from the teachers of the times at the Synagogue. His engaging style of conversation provided insights into people, all with disparate opinions. So when it came to taking a side, Jesus could use good judgment, we call it discernment, to convince many of the Truth. For those He could not change, we can only hope for His merciful judgment. You tip, therefore, is to seek God’s Wisdom, pray for discernment and God’s peace will follow you forever.